During the Vancouver 2010 Games, everyone became a reporter in their own way. Photos, videos, podcasts, tweets, and Facebook updates allowed anyone in town to share what they were experiencing with the rest of the world. While all of the high-fives were happening and the streets flowed with flags and colours of all nations, Andrew Lavigne was making a documentary about social media creating social change. 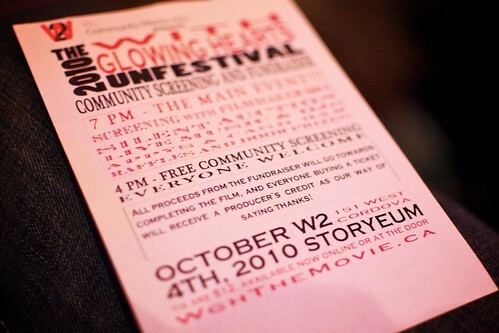 Today is your chance to view this film at the With Glowing Hearts Unfestival. They are doing a screening at 4:00pm that will be free for the community and then again at 7:00pm for $12. The paid screening will include a larger event with silent auction, drinks, Q&A and every ticket-holder will receive a producer credit on the film for contributing to its production. If you’d like to support this film, the social media community, and the continued story-telling of what went on in town during the Vancouver 2010 Games, this is definitely an event not to miss. Thank you so much for telling your readers and the Pecha Kucha world about the screening. It was a great nite!! We were very excited to share the film and it was wonderful to see so many at the screening. Our Manchester and our two Vancouver screenings received very positive response. As a filmmaker it was truly a humbling experience to hear such encouraging feedback. Thx again for your support Miss604! Andrew & Jon and the rest of the WGH Team.